The hallowed halls of Hulftsdorp will be where the fate of Sri Lanka’s most complex constitutional crisis is decided in the coming weeks, if not days, as major political parties map out strategies and counter strategies in their bid to gain control of government. The battleground has now decisively shifted from unruly scenes in Parliament, the home of the legislature, to the courts of law, the home of the judiciary. Meanwhile, the executive continues to engage with different political parties but a quick resolution of the impasse appears as evasive as ever. The current situation developed after President Maithripala Sirisena decided to remove Ranil Wickremesinghe as Prime Minister, swearing in Mahinda Rajapaksa to that office on October 26. This has precipitated a series of events such as the prorogation of Parliament, its subsequent dissolution by the President, the opposition challenging the dissolution in the Supreme Court and the court granting an interim order against it. As a result, Parliament continued its sessions where several votes of no confidence were adopted against the new government and new Prime Minister. After a few unruly sessions where there were fisticuffs in the chamber, the government decided to boycott sittings, a practice it has maintained since then. A vote was also adopted curtailing expenses to the office of the Prime Minister. The government contends that the votes adopted against it are not valid as proper parliamentary procedures have not been adopted. It is against such a backdrop the battle shifted to Hulftsdorp. Late last week, speculation was rife that President Sirisena was close to formulating a solution out of the current deadlock. That was after the Tamil National Alliance (TNA) wrote to the President stating it would support a return to the status quo that existed prior to October 26, where the United National Front (UNF) held the premiership. “We will also support the appointment of a nominee of the UNF who in the opinion of Your Excellency is able to command the confidence of parliament as Prime Minister,” the party told the President, prior to discussions with him. This was in response to assertions being made by the Sri Lanka Podujana Peramuna (SLPP) that the UNF and its main constituent, the United National Party (UNP) too lacked majority support to form a government. “The inability of the MP who was appointed as the Prime Minister, to prove that Parliament has confidence in him as Prime Minister and the votes of No Confidence passed against him pertaining to his claim to be the Prime Minister have created a controversy in the country as to whether the country is without a Prime Minister, a Cabinet and a lawfully constituted government for more than a month”, the TNA noted in its letter to the President. In the ensuing talks with the TNA late last week, President Sirisena informed the party that Parliament should adopt a motion requesting him to appoint a new Prime Minister in view of the fact that incumbent Premier Mahinda Rajapaksa does not currently seem to have a majority in Parliament. President Sirisena also met Speaker Karu Jayasuriya where he assured Jayasuriya that he would meet with UNF representatives as well to seek a resolution of the crisis. The meeting with the UNF leaders was initially scheduled to be held last Sunday but was then postponed to Monday. Meanwhile, also on Sunday, issuing a statement as Prime Minister, Rajapaksa renewed his call for a general election. In the lengthy statement which cited historical instances where Parliament had been dissolved without the concurrence of the Prime Minister in other countries, Rajapaksa argued that a general election was the only means by which stability could be restored. “The only way to restore stability to a destabilized democracy will be through a general election. According to our Constitution, sovereignty is vested in the people and not in Parliament. The manner in which the people exercise their sovereignty is through the franchise. I invite all those who respect democracy to give careful thought to these matters,” he said. However, by the time the President met with the UNP on Monday, the circumstances had changed drastically following a ruling from the Court of Appeal which inquired into the Quo Warranto petition submitted by the collective opposition, challenging the Prime Minister, cabinet ministers and other ministers continuing to hold office when votes of no confidence had been passed against them in Parliament. 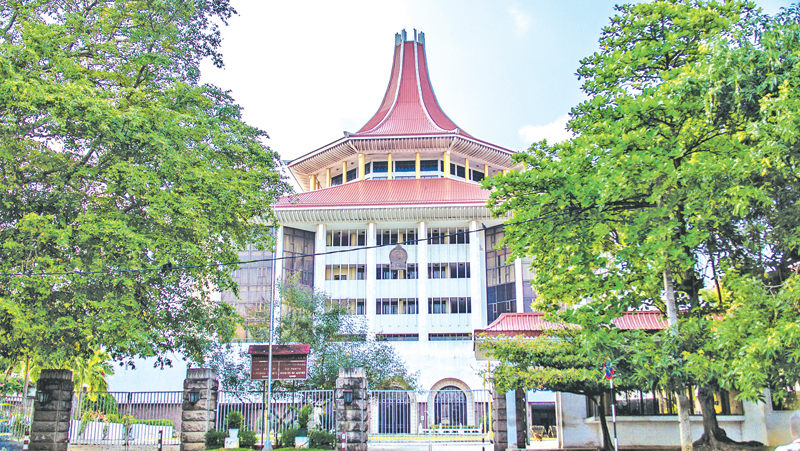 While not making a final determination on the issue, the Court of Appeal bench comprising of President of the Court of Appeal Justice Preethi Padman Soorasena and Justice Arjuna Obeysekera granted restraining orders against the Prime Minister and other ministers from functioning in those capacities. Further hearing has been fixed for December 12 when the respondent ministers have been noticed to appear in court. Rajapaksa’s response to the Court of Appeal’s decision was prompt. He declared that he disagreed with it and an appeal was lodged in the Supreme Court on Tuesday. It was evident that even though a final determination had not been made, the court’s decision to issue a restraining order came as somewhat of a surprise to the government. Held against such a backdrop, President Sirisena’s discussions with the UNF were not fruitful. The President maintained that he would not be appointing Wickremesinghe as Prime Minister even if all 225 Members of Parliament endorsed it. The UNF delegation maintained that its nominee for the premiership was Wickremesinghe and no one else and the talks remained deadlocked on that issue. President Sirisena was to re-iterate his assertion that Wickremesinghe would not be reappointed as Prime Minister at the convention of the Sri Lanka Freedom Party (SLFP) on Tuesday evening. In his speech, the President was optimistic that the current crisis would be resolved within a week. Earlier that day, he had met with secretaries of all ministries to instruct them to ensure that ministries functioned without disruption, in view of the restraining order issued against all ministers. Meanwhile, the Supreme Court which is hearing the fundamental rights petitions challenging the dissolution of Parliament resumed hearings on Tuesday, with a seven-judge bench. The hearings will continue today and tomorrow. The interim order against the dissolution is effective only until tomorrow, unless further extended by the Supreme Court. While recent political developments constitute a crisis, the government previously functioned, albeit with a new Prime Minister and a new Cabinet. With the Court of Appeal decision to issue a restraining order, effective government has been reduced to the President who has enabling constitutional provisions that empower him to take over the functions of ministries. This is what will occur now. It is clear from the current imbroglio that the prevailing state of affairs cannot be sustained over a period of time and a resolution to the constitutional crisis needs to be expedited. However, with the matter being canvassed in several different courts by many interested parties, it is difficult for politicians or their parties themselves to evolve a workable solution. Any resolution must await answers to the legal issues raised, not only because they are relevant in the current predicament the country finds itself in but also because it will become a landmark for the conduct of future Presidents and governments as well. The only silver lining in all this, as noted in these columns previously, is that dissent, by and large has been democratic and expressed in the appropriate manner, rather than being destructive- save for a few shameful days in Parliament.